Garden Grove Unified School District commissioned Counsilman-Hunsaker in March of 2006 to perform a detailed facility audit to evaluate the mechanical systems, programming limitations and detail the costs involved to replace the existing pool to meet current high school and community expectations. 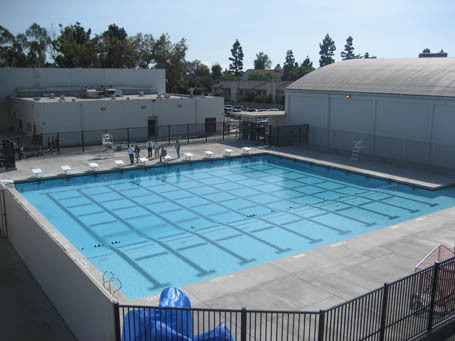 Following careful decision making, in March of 2009 the district contracted with Counsilman-Hunsaker to provide detailed construction documents for the replacement swimming pool and mechanical systems in the existing enclosure and mechanical space. Garden Grove High School first began their women’s water polo program in 2000. In 2004, the Lady Argos finished second in CIF-SS Division VI playoffs. In 2009 the women had captured their 8th consecutive league title and the men’s program had been equally successful. The need for an all deep water polo rink became the ultimate deciding factor that a new pool was required. The newly remodeled facility includes a 25-yard x 25-meter competition pool, score board, timing systems and spectator seating for interscholastic high school competition, community use and municipal summer lesson programming.